A trio of new titles to be published by Esri Press soon illustrates the continuing growth of GIS-fueled solutions throughout the world and the diversity of those solutions. 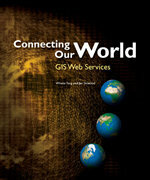 Connecting Our World: GIS Web Services by Winnie Tang and Jan Selwood examines in depth how the expanding capabilities of Internet technology are permitting a wide array of GIS services to be shared over the World Wide Web. By allowing easier and wider distribution to end users and by facilitating integration of data and functionality into other applications, the Web is in fact revolutionizing GIS and spatial data usage. GIS Web services are a natural progression in the development of GIS, continuing a long tradition of leveraging new computer technologies to improve the way spatial data can be managed, accessed, and analyzed by a wide audience. Connecting Our World: GIS Web Services examines more than a dozen examples of this phenomenon. The cases examined here show in depth how organizations are harnessing the technology for national mapping service delivery in New Zealand, digital map creation for on-the-run journalists and producers in the United States, location-based services in Scandinavia, fishing fleet tracking in the North Atlantic, and homebuyers to investigate new neighborhoods and housing opportunities in North America. Illustrated with technical diagrams and Web-based maps, Connecting Our World: GIS Web Services is an essential guide for forward-thinking managers in any enterprise who are interested in fully leveraging the power of spatial data and information. Pinpointing Civil War artillery positions, helping California condors survive in the wild, and assisting subsistence farmers in American Samoa are just a few of the countless ways that the National Park Service carries out its mission to preserve our national parklands. From Alaska's wilderness to the Florida Keys, the park service increasingly relies on GIS to work more efficiently and make better, more informed decisions. Packed with maps, full-color illustrations, and other graphics, Mapping the Future of America's National Parks describes how the National Park Service uses GIS in everything from trail building, wildlife protection, and archaeology to managing wildfires, monitoring park health, and studying human impacts on wilderness. The book offers a wide range of case studies on how GIS benefits our national park system and is written for park visitors in clear, nontechnical language. The accompanying maps, graphics, and photographs are chock full of information that will interest GIS novices and experts alike. Prepared by GIS experts in the National Park Service, Mapping the Future of America's National Parks is a large-format book and includes an introduction to GIS, detailed graphics of each featured preserve, and a map of our national parklands. Taken together, the case studies and resources make Mapping the Future of America's National Parks an essential volume for anyone who wants to learn how the National Park Service is using GIS technology to carry out its mandate in the 21st century. The United Nations Educational, Scientific and Cultural Organization (UNESCO) has declared 2003 the International Year of Freshwater, and few areas have more experience in the management and study of freshwater resources than the European continent. GIS for Water Management in Europe by Mike Bedford examines how organizations and governments in Europe have embraced GIS for a myriad of water resources problems and solutions. Europe's thousands of miles of navigable lakes and rivers are critical to its economies; its coastlines reclaimed from the sea provide land and employment for thousands. Increasingly, GIS technology is the tool of choice for freshwater allocation, study, management, navigation, measurement, storage, and treatment. GIS for Water Management in Europe features case studies that examine how European water organizations in Finland, Germany, France, the Netherlands, the United Kingdom, and other countries are using GIS for tasks such as water quality control, flood control, hydrology modeling, navigation, drinking water distribution, wastewater treatment, environmental planning, and canal design and construction. Esri Press publishes award-winning books about GIS applications, methods, and technology. Books can be purchased from Esri by calling 1-800-447-9778, online at the Esri Press Web site (www.esri.com/esripress), or at bookstores worldwide.